Wally Sosa asked in Facebook if someone had some informations about tatting before 1860. Wrong move to have read this, because all my phylologist twisted senses got awake. So I dug... and I dug... Not the common sources from the American libraries. Not they do not have the info, but by instinct I searched English sources and French ones. I knew from my French studies that there are mentions about knotting in the XVIIIth century and about frivolité as a term applied to a kind of lace. So I did a targetted search for "frivolité", "navette", "frivolité à la navette", "navette à frivolité" and "faire de la frivolité". 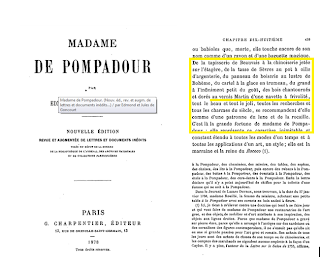 To make a point, from the beginning: Mlle Riego de la Branchardière was definitelly the one to develop the existing technique as we know as modern tatting. But was she the first one? Definitelly not, because I am sure this kind of lace was worked before, one way or the other. 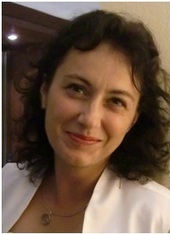 We have the luck to have her compiling this info and publishing her work and new ideas. Sooo... the knotting thing. Nothing to do with tatting, that much we know. BUT the shuttle is there. Proof??? many of them! Just have a look at the beautiful paintings of these nice ladies with their shuttles. If you want, I can indicate some sources. Of course they are bigger than the tating shuttle, of course they do not have united ends, but the shape and purpose to work with thread are there. In an other books dated mid XIXth century the shuttle had in the definition the fact that the 2 blades have "often united ends". My guess is that at the beginning, many of these ladies had these shuttle as presents from their husbands (it was after all, one of the marriage gifts), or they inherit them from a passed relative or protector. I think these shuttle were also used to tat, until someone came with the smaller ones. It was the logical step to do, since the thread was thinner. 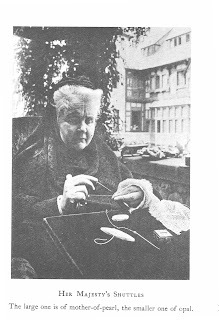 The Queen Elisabeth of Romania was still tatting with a knotting shuttle from the family, and we talk about end of the XIXth century, begining of the XXth. Back to the size, The Dictionnaire des dictionnaires mentions the "navette de frivolité" at pages 890 and 891 as "a tool to make “frivolité”, the shuttle is composed from 2 blades with an olive shape, with pointed extremities and united in the middle. It has to be not more than 7 cm long, and 3-2 cm wide."... still a little bit bigger than the ones we know from Mlle Riego of Lady Hoare. During the XVIIIth century there were a lot of mentions for the French Monarchy or nobility of legacy, or purchases of a "navette" in gold, ivory, with or without precious stones. Mme de Pompadour had a lot of them, the Princess Adelaïde, there are some paintings and drawings of ladies with shuttles. In at least 2 inventories I found "fond de panier à ouvrage avec ses navettes". I have a full list of them, it would me boring to post it here. 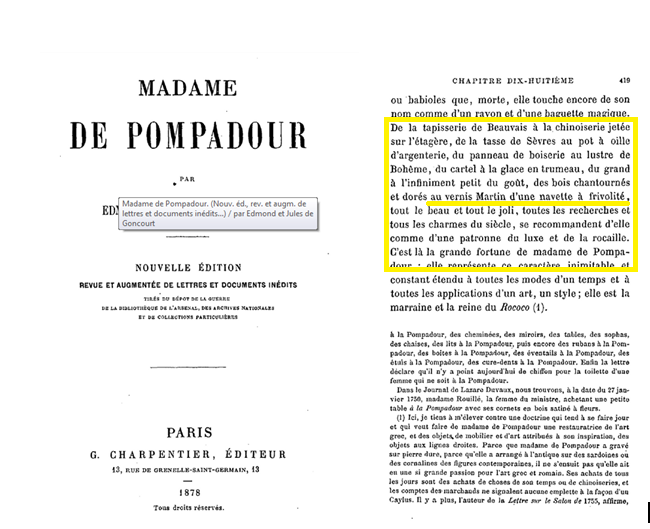 "… From the Beauvois tapestry to the China piled on the shelf, from the Sèvres cups to the soup bowl in silver, (…) from the gold embellished furniture to a Martin laquerer of a tatting shuttle, all these collectors pieces and all the beauties of this century, recommend her as a mistress a luxury and small shiny pile of stones"
During her life, she aquired at least 6 shuttle (I have the references and the prices), 3 of them are mentionned in her testament and in the codicile to be given to friends. 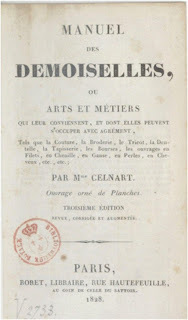 The interesting part is that in an inventory done at the Court of Louis XV, there is a clear mention of a "navette à frivolité" (Inventaire des tableaux commandés et achetés par la direction des bâtiments du roi (1709-1792) : inventaires des collections de la couronne / rédigé et publié par Fernand Engerand). 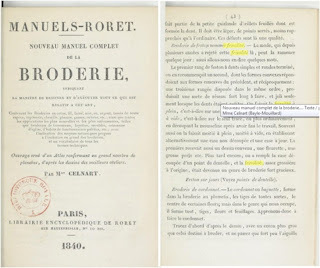 With one book printed in 1828 we get a bit of information about what frivolité was in France: a sort of edging, done with a needle or a shuttle (a bit later), consisting, mainly of chaings. It is the Manuel des demoiselles: the term frivolité is there, page 53. 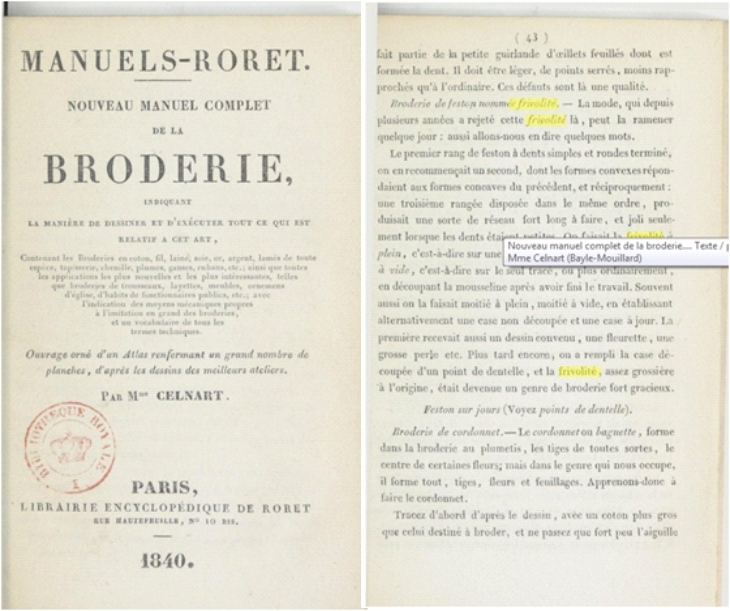 In 1851 I found the first mention of Mlle E. Riego de la Branchardière. She participated to the The great London Exhibition, at the section Tapestr, lace, textile ... with crochet. Funny thing is that I searched first for "tatting", I knew Gallica digitized also English texts. So I found a certain S.A. Ellis, "United Kingdoms, speciments in tatting collars, etc" who got an honorable mention. Then I searched for "Branchardière" and I found her at the same page, first column. Long story short: yes, there was tatting before Mlle Riego, I think she put on paper what she knew from France and England, and yes, she changed the tatting as it was until her, by making it easier, lacier, with more elegance as never before. Thank you Wally Sosa... without this innocent question of yours I would have never put my nose to dig in dusty archives and I would have not learned so much. Anecdote: Mlle Riego was sewing the beads on the lace. 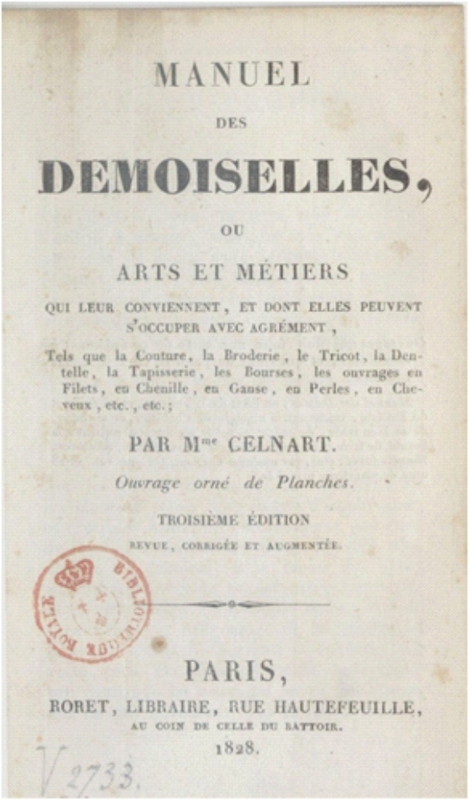 In The Complete Book of Tatting, at the Parisian Gymp Trimming (guess. page 25), she indicates it very clearily! I am no longer ashamed. beau travail de recherche !!!! Armenian knotted lace is another example of this type of lace. I am convinced that in tatting we have all techniques melted toghether. I think this is possible. Crafts eolve like everything else. Knotting, crochet, embroidery and netting techniques or tools are to be identified in tatting. I would add to the 7 ones the tatting done with the celtic needle wich is a netting tool. Thank you for this information. It advances the age of Tatting by many years. I hope it helps a bit to get some more ideas about the history of tatting. Il will have nowto corroborate more info I have. There are more than 1 things I found, I need to check them. I did not yet searched in the German books. I know they worked this lace too.